The final destination of man is a recurring problem for all. For all time, men have asked themselves what lies beyond this life. One could not stop asking the Lord this question. That is why they ask him if only a few or many will be saved. The Lord responds that Salvation is within everyone’s reach. What happens is that not all are ready to walk the path that leads to it. The path that Jesus offers demands personal acceptance. It is not enough to belong to a particular people, a Christian family, or to practice a religion for tradition’s sake. You need to personally accept the Gospel of Jesus and always be ready to fulfill it, despite the falls you might have or the weaknesses you will not be able to overcome. The Lord also tells us it is not a path of roses, but a path of work, effort, and bravery, walked (yes this is true) with joy, pleasure and enthusiasm. Sometimes there is an effort to take away from the impact and importance of what Jesus says. They say that God is good and cannot punish. That God is the Father and cannot condemn. That is true. They are right. God is good and does not punish. God does not condemn. We are the ones that shut the gate, take the wrong way, leave our route and cause an accident. So we are the ones that save ourselves or get lost. God offers a path and we accept it or we reject it and God respects our decision. But the path is demanding; it is not about “savings” or “discounts”. It is often very hard; like a highway going up the mountain. And the path affects our whole life. It is not a question of whether or not we go to mass or receive the sacraments or do something good on one occasion. It is about turning our life to God with all of our soul, mind and heart. And that is hard. This is why the Lord insists, saying: “strive to enter through the narrow gate”. We just need to leave our baggage behind. You only need to bring a heart full of love and for that, there is more than enough room, however narrow the gate might seem. God will bring us to eternal life, to his Kingdom. He is waiting for our clear answer and we hope we are ready to make the right one. Jesus speaks of the narrow door and even that it can close. This is a call to our sense of responsibility. Salvation is a gift from God, but God wants our answer because God respects our freedom. That’s why St. Augustine says, “the God that created you without your consent, will not save you without your consent”. Keep in mind that saying that the door is narrow is not a threat but a call to our responsibility and our clarity. To participate in the delegation this week, we left our families, our jobs, our commitments in the community. We came because it is important for us. We came to learn, to share your culture and to strengthen our sister parish relationship. We see now it was worth it. They asked us this week how we will talk about the sister parish relationship. For us it is about giving yourself, commitment, and love from all for all. This has changed our life, for St. Joan of Arc and Tierra Nueva 2. You have said it strengthens your faith, that you conserve water because you have seen scarcity, that you take care to respect the dignity of others. We are not like bosses with unequals. We are a family. 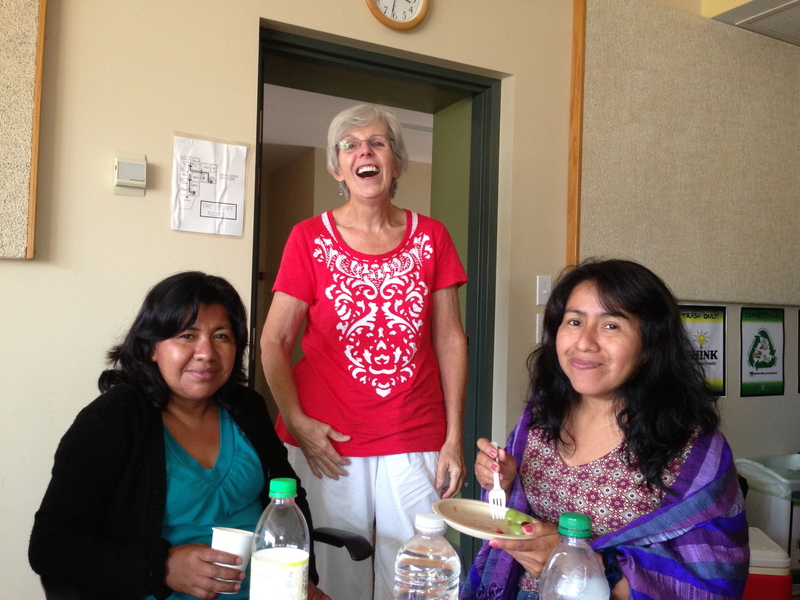 The first day we came you asked how our mothers and community were doing. We saw all your efforts to make us part of your life, family and community. 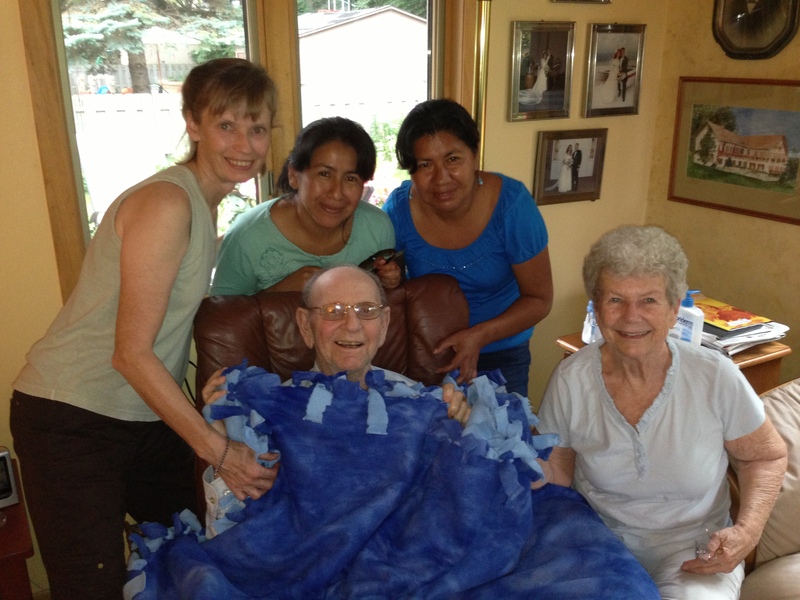 Among the most powerful experiences, we made a prayer shawl for Bob, a member of St. Joan of Arc currently in hospice care, and we sent him our prayers with the shawl. Afterward we reflected on how we want to be remembered when we are gone. 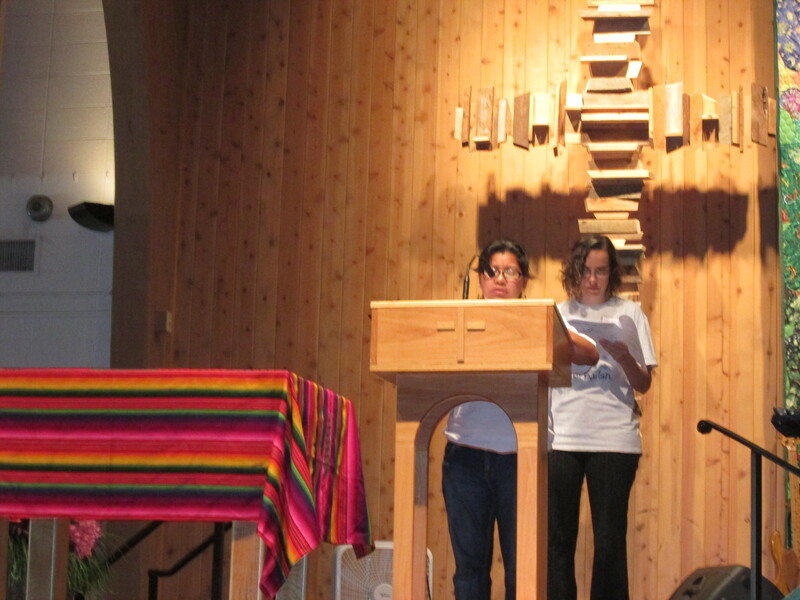 For us, the sister parish relationship has awakened our conscience. We learn and look for solutions together in solidarity. We realize that there are people in the U.S. that work for peace, not just war, that people advocate for an immigration reform that could affect our families, and that we can work together for a more humane world. When we went to Mobile Loaves and Fishes, it made us sad because some of us are dying of hunger while others use up everything. Why can’t we find balance in our world so that we can all live well? Our awakened conscience motivates us to continue to struggle for peace with justice. This experience has helped us to see beyond what we imagined. We all need each other. To see how you help others opens doors for us, to realize that we can too. Sometimes you think “I can’t, there’s no way out,” but there is always a solution, you just need to listen to the Word. The reading invites us to live now the way we want to in the future or the ever after. 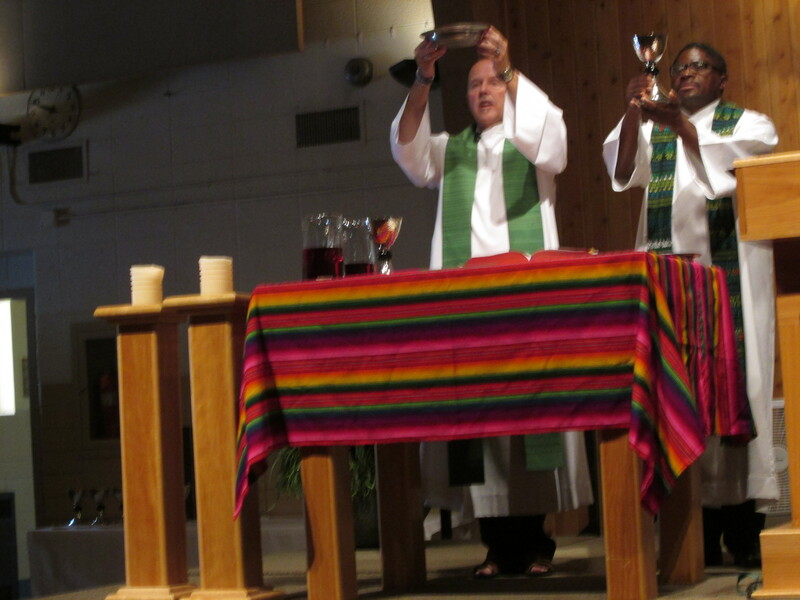 Living in unity with our sister parish is the most beautiful way we can live, this appreciation, this mutual respect, this equality – that is the building of the Kingdom here on Earth, that is what is means to follow Jesus. This entry was posted in Delegations, General, South to North, United States and tagged delegate reflections, south to north, st joan of arc, tierra nueva ii. Bookmark the permalink.